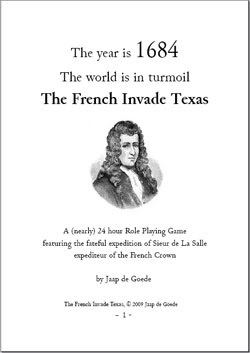 The French Invade Texas is an alternative-history (sort of) roleplaying game by Jaap de Goede. 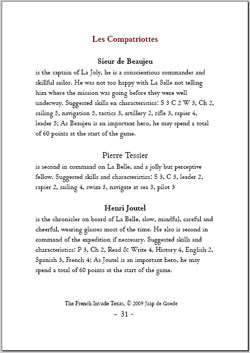 Play the role of La Salle, a French explorer and use the King of France's extensive resources to colonise and fight the Spanish. I became a fan of Jaap with Dark Dungeon and I'm proud to say I still am. If the title itself isn't enough to spur you to read on then perhaps you might enjoy witnessing the gradual slide of blog quality as sleep deprevation causes that thin line between awake and asleep to fade. It is clear that Jaap had a Wikigasm when writing this. 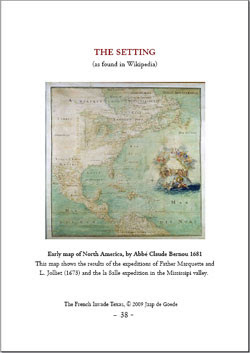 It is based in the late 17th Century when northern America was colonies (what we call in Europe the Good Old Days). You play out the voyages of Louis XIV's favourite La Salle who popped across the pond for some territory theft. However, the Spanish had got there before, so you'll be stealing some of theirs. They won't miss it. It's buckling of swash with all the interesting elements from that era: native Americans, mystical cities of gold, Conquistadors, pirates and so on. Crafting your avatar is a point based affair. Characteristics are your attributes - Strength, Constitution, Agility, Perception, Willpower and Charm. They do what they say on the tin. Zero is an average, with positive and negative values placing you either side of it. The skill list is brief but exceptionally useful. One of the characters really should be the French explorer La Salle, who the game is about. Think of it as the team leader, which in our gaming group is code for "The first person in trouble". Jaap suggests that the most capable player plays La Salle. In our group, this would mean the player would was out of the room when the choice is made. You can play one of his compatriots (example PCs straight from the history books) or use them as a starting point. A stock 2D6 + skill (or attribute) to reach a target number is used. The difficulty level examples are a delight: "15- convince the Spanish Inquisition you are innocent". Critical failures on double 1 and on double 6 you critically succeed and keep rolling, adding the numbers up. Combat is performed in an old fashioned (as in lemonade - you know bitter, bits, no sugar and a hit that makes the edges of your mouth yearn to be near your ears) manner. You take it in turns to lunge and repost. You might find yourself bellowing "Have AT YOU!". You take it in turns to slot each other up a treat until one of you can't any more. If you're not the one on the floor bleeding then you're the winner. Well done you. Ignore the corduroy clad bearded buffoon with the chalk and the dates. History is fun. The bad chaps are really very bad indeed. Genocidally bad. The good guys are mostly bad too. 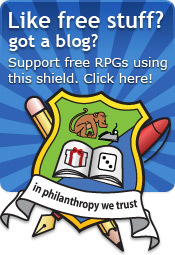 That would appeal to my players, who don't do good and evil. They varying shades of evil. Jaap has included some superb hooks and adventure plots - which are absolutely ideal as there is a lot of background to get your head around. Jaap didn't quite manage to complete The French Invade Texas in 24 hours (it took 30), so it is ripe for my usual improvements. As the game is inspired and built upon history, there is a lot of it and it still feels very Wiki in the way it reads. I think it needs a bit of trimming and representing for the modern roleplayer. There are some spelling mistakes and I think the organisation could be improved. On a minor point, the game is written as a game for brand new gamers and I think that's probably not the target market. I'd rather see it written with experienced gamers in mind. The French Invade Texas is a superb idea that will be bread and butter to history buffs and intriguingly novel to the rest of us. A dark section of European history that is rife for the plundering and yet rarely is so. Written with Jaap's usual flair for English, even the historically illiterate will find La Salle an interesting personality. It is rough in places and can be heavy but like a good rocky road brownie, it's delicious because of it. Too bad I can't download the pdfs on the page you linked. Whats gives? Excellent review. Very intresting idea for a game! and here i thought i was the only bulette in town. vive le france! Wikigasm is my new favorite word.